"Challengers" was created in 1970 by Laszlo Tar. It's Sunday afternoon and Central Park is packed with strollers and performers, children and pets. There is a bench near the Wollman Rink, out of the way of the hot Summer sun, where a couple finds their challenge in a simple game of chess. And Laszlo Tar was there to capture the simple beauty of it all. 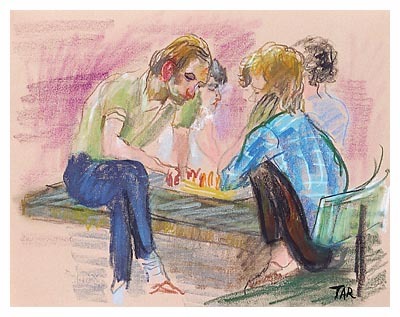 Click here to see all Chess Player prints.